Instead of getting lost in emails, we will be using Asana to manage our project. 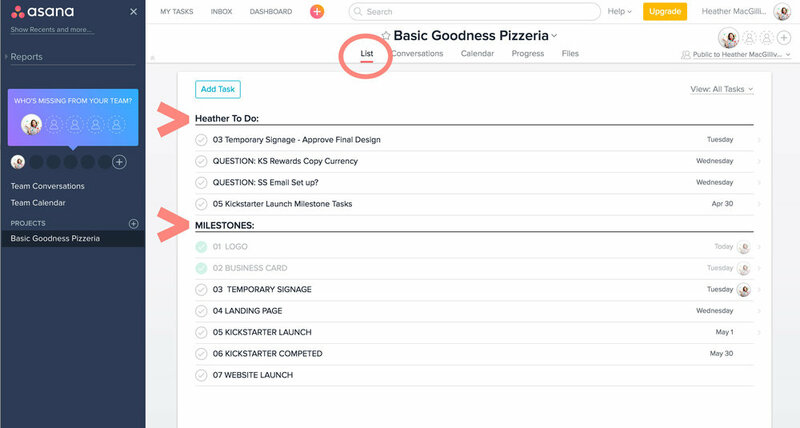 Asana is super easy and lets us keep on top of Milestones and To Dos. It also will be where we communicate and review milestones. All draft and final files will be sent through Asana. Here is what the Email Invite will look like in your mailbox. Click "Accept Invite." You will be directed to Log In. If you do not yet have an Asana account, click "Sign Up" in the bottom right corner. You may receive a pop up from Asana about using a personal email. You can ignore this and click "Continue with my email" in the bottom right. This will be the screen when you log in. In the left column you will see our new project listed under the "Projects" header. Click on the project to enter. Here our Project Milestones are listed out. Also your Client To Dos. Make sure to pay attention to this list when you first log in. There may be some Client To Dos that need to be completed before design can start on the project. Here is where we communicate - instead of emails. Progress files will be posted here for review and final files will be attached for you to download and reference. List & Conversations are the main sections that we will be using. To change your email settings, click on your Icon in the top right hand corner. Choose "My Profile Settings" and then "To Email." Keep "Task Reminders" checked so you will be alerted to any To Dos you need to complete.